kesouli was a registered brand in United States. We are ready to provide each customer 7*24 customer support. All our product have 30 days Money Back Guarantee and 120 days Replacement Service. Why need a endoscope camera? 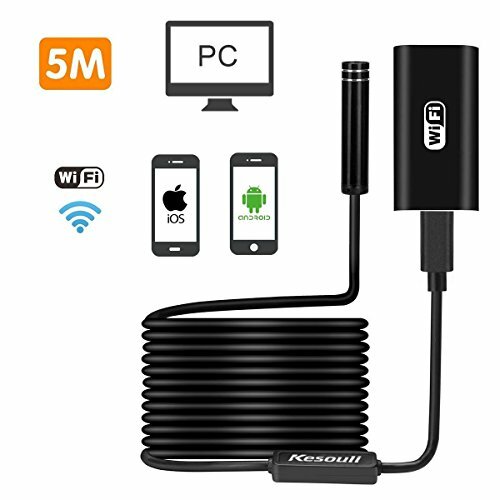 This Kesouli wireless endoscope adopts high quality material with widely compatibility which can support IOS/Android smart phone/PC /Macbook. Featuring with 8.0mm diameter camera, 8 adjustable LED, 2.0MP CMOS HD camera, the wifi endoscope is a utility class equipment with the function of real-time video viewing, video recording and picture capturing. WiFi borescope inspection camera is a best tool for inspecting hard-to-reach or hard-to-see places, such as vehicle repairs, sewer inspection and maintenance, vent pipe inspection etc. Even if you're new to use wireless endoscope, you'll be able to get the hang of operation quickly. Once installed the app via WIFI, then you're ready to go. ◆ WiFi Version, Support IOS and Android Systems - Without using extra adapter or cable, it can be easily connected with your phone or tablet via WIFI with its WIFI transmitter. This borescope inspection camera work with not only Android smart phone, but also IOS system. NOTE: This snake camera isn't supported by Windows 10. Please think twice before you buy it. ◆ Featuring 5m/16.4 ft Flexible Cable, Bendable Freely - The wireless endoscope coming with 5 M( 16.4 ft ) length bendable and flexible semi-rigid durable cable, it has best length to handle for daily use. Besides, flexible semi-rigid cable can bend and hold its shape to access to kinds of confined place to meet your different requirements, such as access to curved holes or pipes. ◆ IP67 Waterproof, 8 Adjustable LED Lights - The borescope inspection camera featuring IP67 waterproof level camera probe and 2 Megapixels HD camera allows it to work well in sewer or underwater. It provide you a wonderful experience of recording a HD video in AVI format and snapshot image in JPEG format. A turning wheel works to adjust the brightness of built-in 8 LED lights on the camera tip, which can greatly help to adjust brightness even in dark or low-light condition. ◆ Easy to Set Up - This wifi endoscope can be easily connected with your smartphone via WIFI. Just need to download and install the "MOQO" APP by scanning the QR code on the manual or search it in your device. And then install the endoscope app and sync up with your IOS/Android phone or tablets, just start your inspection work with live viewing through WIFI. ◆ Widely Use - A ultra small size of 8.0mm diameter, 8 adjustable tiny white Leds, waterproof IP67, HD high quality images, with these features, the inspection camera could be widely used, such as cable routing, sewer pipeline detector, archaeological detect, home care, underwater micro- cameras, aviation and space industries, petroleum drilling industries, constructions, criminal and custom detector. View More In USB Microscopes. If you have any questions about this product by kesouli, contact us by completing and submitting the form below. If you are looking for a specif part number, please include it with your message.